IC stands for "Integrated Circuit". An IC is a tiny circuit made up of resistors, diodes and transistors and placed in a single package. Each IC has a part number and is created for a specific purpose. ICs are available in different packages. 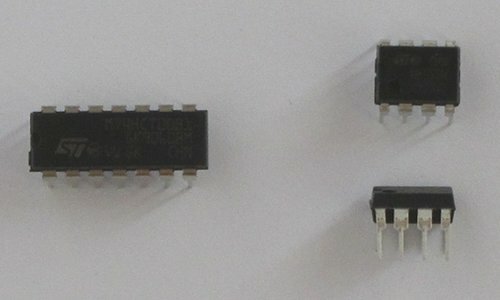 The photo below shows from left to right – an IC that contains logic gates packaged in a 14 pin package, a timer IC in an 8 pin package and a voltage regulator IC in a 3 pin package. 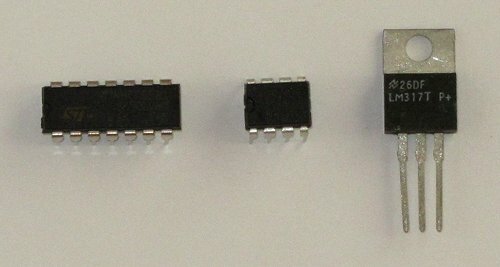 Transistors are also available in the 3 pin package shown above. This specific package is known as a TO-220 package. The part number will tell you whether it is a IC or a transistor in this package. This is done by looking up the part number using a search engine on the Internet or entering the part number into a search box on the manufacturer's website. All ICs are marked with a part number, no matter in which type of package they are packaged. When beginning electronics, most of the ICs that are used will be packaged as DIP (Dual In-line Package). IC pins are all numbered, e.g. pin 1, pin 2, pin 3, etc. On a DIP IC, a half-circle will show at which end of the IC pin 1 is. Pin 1 may also be marked by a dot next to pin 1. With the dot or half-circle on the left, pin 1 of a DIP IC will always be the bottom left pin. 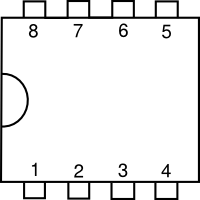 Successive pins are numbered to the right of pin 1. When the end of the bottom row of pins has been reached, numbering continues with the top right pin and continues on the top row from right to left.